There are lots of hamster homemade toys ideas, including the hamster maze. Hamster mazes are another hamster favourite. To put one together, you can use wrapping paper tubes, shoe boxes, plastic pretzel jars, cereal boxes, short lengths of PVC tubing, cylindrical oatmeal containers etc. 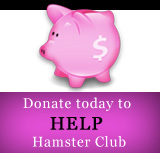 This is a fun project for all hamster owners and will also be a brainteaser for your hamster to have fun in! Put the maze into the play area and watch your hamster go! 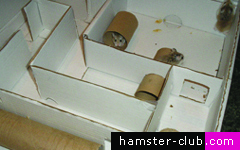 Another option of building a hamster maze is by using Legos instead of paper tubes / boxes. Take the Legos and first make the top; make like a little side walk kind of thing and when it starts to lean make a little part of the the wall. 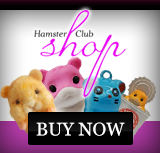 Put in random stops and make it tricky...hamsters love those kind of things.